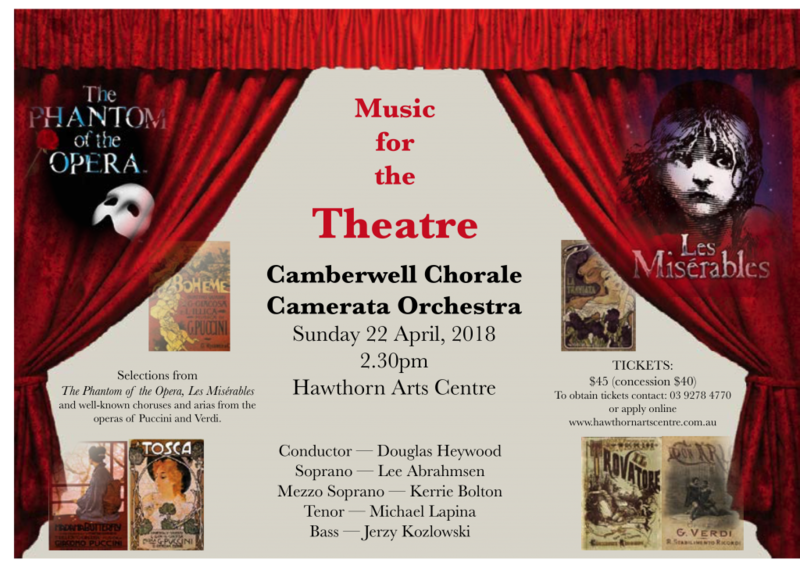 Join us at the Hawthorn Arts Centre, Burwood Road, Hawthorn, on Sunday, 22nd April at 2:30 pm for Music for the Theatre. Following the choir’s China Tour, the programme will be repeated in association with the Camerata Orchestra. We’re delighted to be joined by Lee Abrahmsen – Soprano, Kerrie Bolton – Mezzo Soprano, Michael Lapina – Tenor, and Jerzy Kozlowski – Bass. The first part of Music For The Theatre will be selections from The Phantom of the Opera, Les Miserables and the five spirituals from Michael Tippett’s A Child Of Our Time. The second part will be a selection of well-known choruses and arias from the operas of Puccini and Verdi. Book Online or use our contact form to request more details.